Wind Damage is the most obvious type of damage to identify. However, typically are an excellent indicator of storm damage. 1. 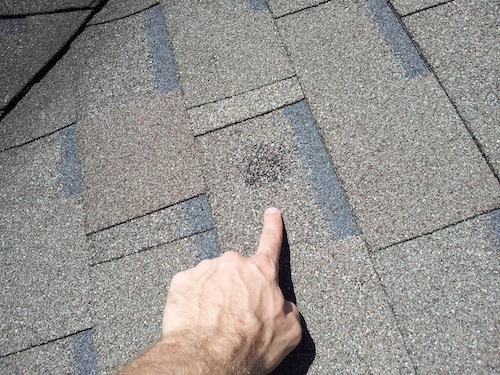 MISSING SHINGLES: If you see missing shingles on your roof, it’s an obvious indicator that you have storm damage. 3. BLOWN OFF EXTERIOR COMPONENTS: Blown off fascia, siding, gutters or other exterior components are all indicators of wind damage also. Your neighbors are all getting new roofs! If you step out your front door one morning, or come home from work one evening and see your neighbors getting a new roof, or have solicitors knocking on your door to sell you the promise of a new roof, politely tell them, “No thank you!” Then call your trusted insurance restoration specialists at Joshua Miller Roofing for a complete property assessment and inspection. Neighboritis, as we affectionately call this phenomena, is typically the largest influence on a homeowner’s decision to get their roof inspected by a trained specialist. It’s hard to see ALL your neighbors getting new roofs and think that you wouldn’t either. ALL of these tips, on what to look for, will help you decide on whether or not to have your property inspected. Not all of these must be found to warrant calling for an inspection, but even finding one is an excellent reason to have your home looked at. Besides, it’s FREE! Don’t trust just any company with your home. Be sure to verify the reviews and ratings for any contractor your are considering to hire. Here is a link to a HomeAdvisor article about Hail Damage and other storm damage. You can find ratings and reviews for JM Roofing Group there as well. Do your homework and then call us today!